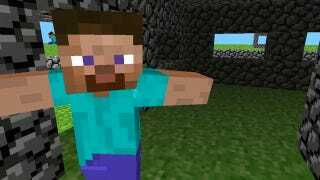 Whether you love it or hate it, Minecraft's one of those games that caused a seismic shift in the culture of video games. It lets people create in a massive scale and, as a result, can reveal more about the subconscious of its users than other massively connected online games. As it turns out, it's also made a boatload of money. The stat counter at the official site just passed 4 million copies sold, which, at about $21.95, puts its revenue at around $80 million. Not bad for a game that's yet to be officially released. Sure, there's all kinds of accounting and price variability to take into consideration, but even half of that hypothetical number is impressive for a game that rolled out into the world with little marketing, PR or promotion. Minecraft's coming out of beta this week and fans will be gathering to celebrate its blocky beauty at the first-ever Minecon in Las Vegas this next weekend. With mobile and Kinect versions on the way, there may be even more audiences for Minecraft to dig up, too.